He is known in the world's financial centres as Japan's first M&A adviser, as well as a highly respected investor. However, he has cast off and moved on from the achivements of the past and is now making an impactful investment into Myanmar to help Noble laureate, Aung San Suu Kyi's new government. Interview Title: "Suu Kyi as landlady changed my life"
-Did you stay at Aung San Suu Kyi's house in Oxford in 1984? "She came to say hello when I was reading a Japanese newspaper at the Nissan Institute. She was very friendly and approachable. Two years later, I met her by chance in the road. She asked me whether I wanted to rent her top floor. I became the first lodger in her house. Most people find this story extraordinary, especially those people who came to know her recently as they think she does not appear approachable. 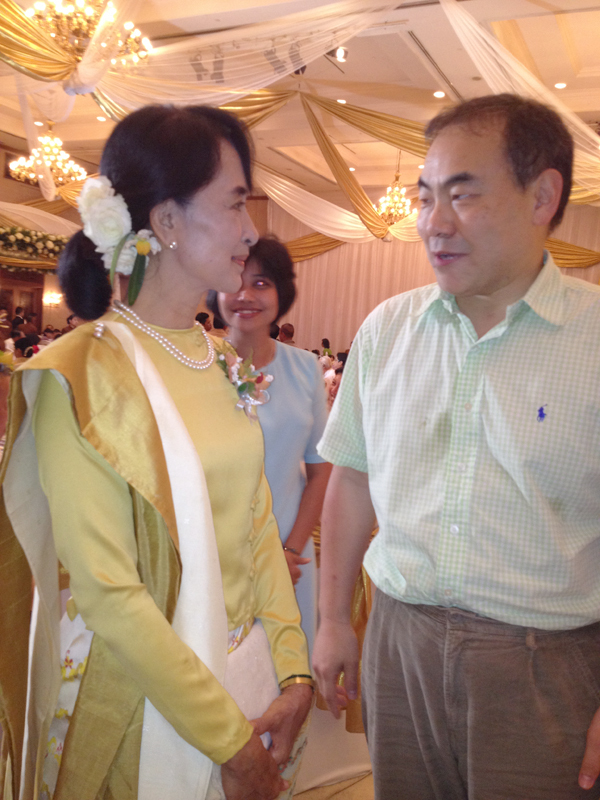 -Why do you think Dr Suu Kyi invite you to be her lodger? "It seems that Japanese students do not make much noises by inviting many friends round. She, Michael (her late husband) and I had dinner together at her home, and she also explained how her father respected Japanese. "After she was released, I decided to visit her country for the first time in 2012. Met her for the first time in 27 years through a mutual friend who thought my interaction with her was unique. Felt the country is going through dramatic change, and decided to help her develop the country in the way she envisaged. It was the first time that I decided to make investment, irrespective of the return. - Where are you making investments? "Building the most modern type of rice milling centre which has the best form of technology with capability of doubling the productivity of farmers. Also, I want to bring the world's best technologies in aquaculture which casue zero damage to the environment of the country which preserve nature. The Burmese average age is only 26 years old. It is similar to that of Japan at the beginning of Meiji Restoration. The growth potential is huge. - You have built your reputation being the first Japanese M&A adviser. Is that experience relevant? "The M&A adviser's job is to advise clients to buy companies cheaply or sell expensive companies. There is no direct relation to what I do now. However, being the first in the business, I need to be creative to be both liked and supported by clients. For example, clients love my proposal that our fees are directly linked to the acquisition price in order to align the interest between the clients and advisers. "It was the time for hedge funds. I was fortunate to have $100m on Day 1 which grew to over $200m by the end of 2005, winning the fund of the year award for Japanese equities. It was pure luck. I was lucky. - Will you continue investing in the global markets? "I no longer go short equities to make money. I shifted from being a hedge fund manager to private equity and rather focus on areas of growth. Myanmar amongst other South Asian countries is an obvious destination. It was back in March 2016 when the NDL government started in Myanmar. "I was rather surprised that my ex-land lady was so charismatic.I would not have become so enthusiastic towards Myanmar if I did not meet her." Married four years after I met my wife in 1988. "My wife was working for a British competitor bank when we met.She's a very internationally minded woman.She was keen to move and live in the UK.At home, my wife is in charge. (laughs)"
Lives in the UK with his wife and four daughters.English is the language at home although he speaks in Japanese with his wife and first daughter.Believes that, when the children are grown up, all Japanese will speak English in business. Like massages a lot. Tries to walk 10,000 steps everyday.